← Abbey’s Successes, many, many firsts! New Struggles, New Answers DAILY=Exhausting! So every day, it’s something new. One thing about autism is, it’s never boring. You work on one behavior or challenge, just to have another one pop up! Yesterday it was, how do I get Abbey into Walmart because we’re out of toilet paper…yep, we made a story on Pictello about being out of toilet paper and made a grocery list in her story…worked great! The things you have to do to get toilet paper, gheesh! Today, she’s back to playing in the water in the fish tank. Yep, thought we had that one licked, so sometimes you even get to go back to an old challenge and take it on again, fun! As you can see, from the picture, I put a bowl in the sink for her to play in. 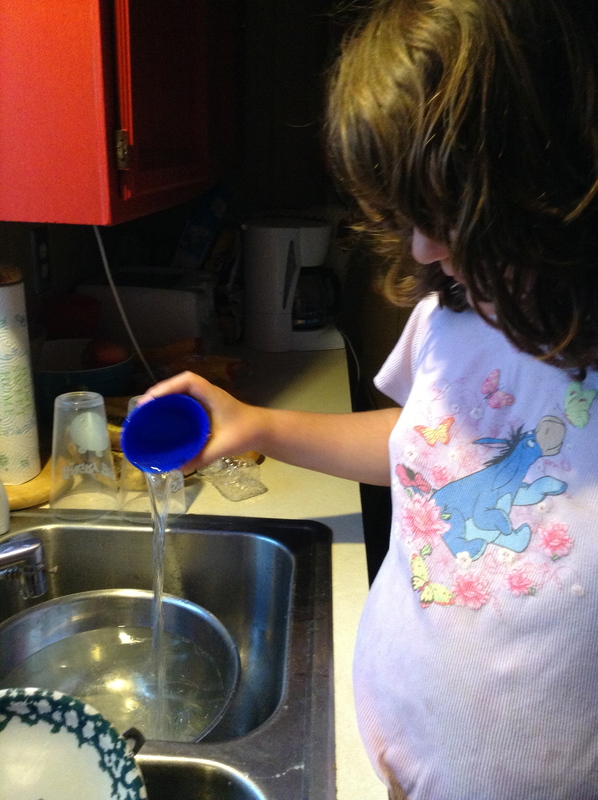 AND, added a picture of a faucet, with the words, “play in water” as a button on her iPad, so she can ask…super important! Communicating is the key to it all, we have finally figured out! She’s asking permission now before she does things, when she has a way to! Obviously, today is a water day and it’s winter, no pool. What is it with water and our kids with autism? They love it! She used to ask for baths all day, when she was younger. That was too much, got out of that one. So, sometimes you have to go with it, figure out how, not to get them to NOT play in water, but how they can. It’s like that with so many things. If you fight the challenge, it will win..you have to find a middle ground, something more acceptable, replace what you don’t want them to do with something that they like and you like too. Yeah, not always an easy task! 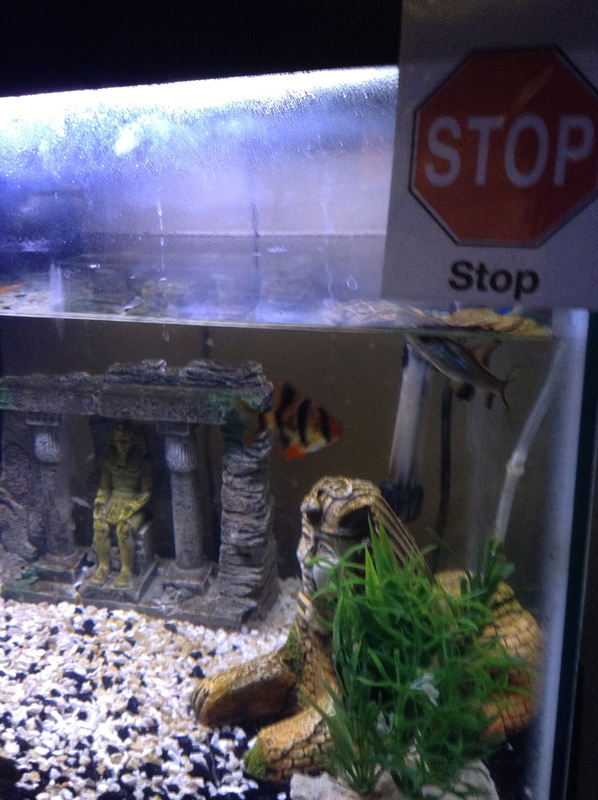 What worked in the past with the fish tank was a “Stop” sign. Ok, we had tried the stop signs in the past on things, didn’t work. So, sometimes what didn’t work in the past, good to take it out and try again, you never know. It seemed to work this time, yeah! Talk about an exciting day when she pulled me to the fish tank and put her hand on it, looked at me and I pointed to the stop sign…and yes, she accepted it, walked away and didn’t play in it for weeks, until today! So, what’s your daily challenge today? Is it potty training, or something that is a daily challenge that won’t seem to end? Or is it a new challenge that just came up today? You get to be a detective every day, some days that’s pretty cool…other days, exhausting! Hang in there! Even those challenges that seem like they aren’t getting any better, usually, over time, with work, they do! Then you get to look back and feel a massive amount of accomplishment! And that, is a totally amazing feeling. Don’t forget to look back and see what you have accomplished when you’re working on your new daily struggle, it will help you have hope and the will to get through it! I love how the past and present are pulled together here, also how something that is so mundane for most is highlighted as being quite the opposite…yet worked out well after all for today! =) Quite the clapping moment with that and the stop sign on the fish tank =) That Marine Biologist in Abbey is bound to come out one day! So true my friend…our struggle right now is the screaming f—, g–d— ect. The frustrating thing is we don’t know what is making him so mad! Oh Eva, poor guy! Even when they are verbal, they often can’t tell us what is wrong. I sure know that helpless feeling of wanting to help them when they are struggling, but you don’t know how! Hugs to you all, and lots of prayers!